Ubiquitous to many urban areas, the inverted 'U' bike rack has become the de facto bike rack for streetscapes everywhere. It's easy to understand why—with its simplistic, compact design and small footprint it is perfectly suited for high traffic areas. The 'U' rack provides ample space for two bikes to both properly secure wheel and frame. 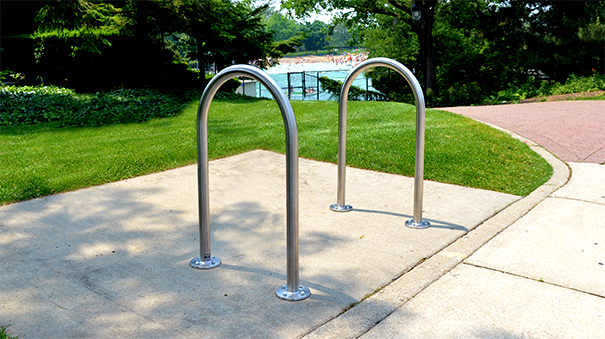 These imported bike racks are constructed with high grade steel and available in black powder-coated finish or 304 stainless steel, both are ready to weather continued exposure to multi-varied weather conditions. 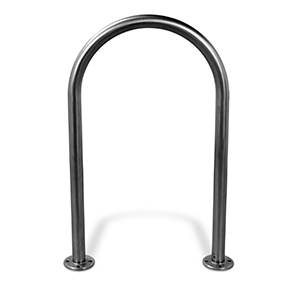 The solid base flanges provide a sturdy means to surface mount the bike rack while also providing a full seal over the tubing's open ends that prevents	unwanted moisture and creepy crawlies from getting in. ►Need a Bike Rack Fast? ► Items ship within 72 hours on orders up to 2 units.